Ear piercing is very common for both genders these days. The amount of comment and the reactions you get usually depend on the circles you move in. On average, though, it seems that any comments about pierced ears usually last about a day and people move on. So why would you get your ears pierced? As a crossdresser, the main reason has got to be the vast selection of earring styles that become available to you. Clip-ons also tend to be relatively heavy and slip off and disappear at the most inopportune times. Unless carefully adjusted, they can hurt after long periods of wear. Pierced earrings have none of these disadvantages. The final decision, of course, is yours. However, should you decide to go ahead, read on. I had my ears pierced at a salon by a person who specialises in piercings (all locations) and learned most of what I know from him. First, and most important: Go to a reputable place. Ask for recommendations from your friends and visit the place yourself. Look for scrupulous cleanliness. Fresh surgical gloves and fresh piercing tools for each ear are an absolute must. Second: ask about all your options. There are two main ways to do ear piercings: the gun method and the needle method. Each has its advantages. 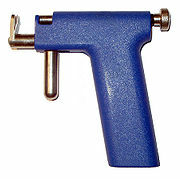 The gun method is quick and easy to do and requires less training on the part of the piercer. A hand-powered gun drives the piercing stud into the ear. Other places use two guns simultaneously. The plastic bodies of guns can’t be totally sterilised between uses, so they use a sterile, sealed disposable cartridge that inserts encapsulated sterile studs. The needle method, preferred by most professional body piercers, uses a hollow medical-grade piercing needle and a receiving tube. The piercer presses the needle firmly through your earlobe and into the receiving tube by hand. The advantage of the needle method is that the equipment is totally disposable. Here’s what all this stuff looks like. Ask about aftercare. 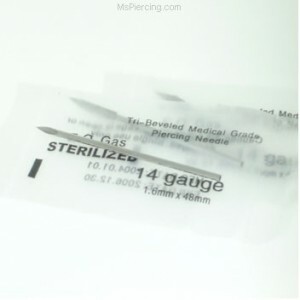 You should be given detailed instructions, plus a handout and some sterile saline to keep the piercing clean. Pretty studs are a nice way to celebrate your adventure, but here again, caution and long-term success should be your guide. Studs can be extremely hard to remove if your ear swells or becomes infected, and their design tends to keep the infection inside rather than letting it drain. A better choice, if rather less glamorous, is surgical steel rings. These leave room for swelling and also leave the piercing clear for easy disinfection. Sure, you’ll look like a biker chick for a few weeks but after that your ears will be nicely healed. And after that – anything goes! Rings can’t be inserted with the gun method, of course. Okay, you’ve found the person you want to inflict pain and bloodshed upon your person – what can you expect? The piercer should be wearing a new pair of surgical gloves. The equipment (needle and tube, or the gun cartridge, plus the jewelry) should be in sterile, unopened packaging, opened immediately before each ear is done. She will mark your ear with a sterile marker and confirm the positioning with you. If she’s using a gun, she’ll install the cartridge (which holds the stud), mount the stud and its backing in it and place it over your ear. A deep breath, a sharp pain that quickly goes away, and you’re done. If your piercer uses the needle method, she will hold the hollow receiving tube firmly behind your ear. 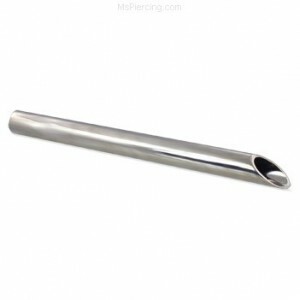 The needle will slide into the tube, thus protecting your piercer’s fingers. She’ll then place the needle firmly on the mark on your earlobe. A deep breath, a firm press of the needle and a sharp pain that quickly goes away. She’ll remove the tube and fit the end of your steel ring into the end of the needle as she withdraws it, then clip a tiny ball between the ends of the ring to secure it, and you’re done. Oops, not quite. The other ear is next. A freshly opened gun tip and jewelry or a new needle and die, and away you go again. Aftercare is critical to success with pierced ears. Don’t rotate your studs or move the rings around. Doing so will damage the newly healing skin inside your ear and slow down the healing process. You can also transfer dirt and germs into the wound. Rinse your ears with sterile saline several times a day. Disinfecting solutions, even those marketed as aftercare products, kill not only germs but tender skin cells trying to heal. Pressurised containers of saline, usually called “Wound Wash”, make sure everything stays clean. Squirt it generously on the front and back and let it soak in. Cleanliness is essential. Wash your hands before touching them, sleep on a clean pillow and don’t let other people touch them. Showering is OK, but avoid rubbing your piercings. You can expect some discomfort for the first day or two. There will probably be a yellowish discharge from the wound; this is a normal by-product of the healing process. However, if you experience excessive redness, pain or swelling, remove the jewelry if you can and check back with your piercer as soon as possible. After 6-8 weeks, your ears should be healed well enough to remove the piercing jewelry and start experimenting with nicer stuff. Watch for allergic reactions. Make sure your first jewelry purchase is something you can wear 24×7. Your ears will want to heal over at every opportunity for at least six months, so you can’t leave them unoccupied. I’d recommend small studs in some unobtrusive design; you can sleep in them fairly comfortably. While you’re out shopping, drop into a craft store and pick up a package of nylon earring stops. These tiny things push onto ear wires or posts and keep your earrings from flying off. The metal clips you get with post-type earrings tend to work loose; I usually discard them immediately. A package of about 200 retainers should be only a few dollars. Welcome to the world of pierced earrings!